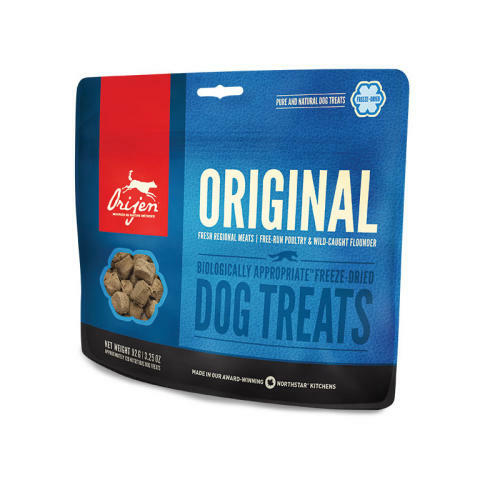 The delicious and nourishing Orijen Freeze Dried Original Dog Treats are gently freeze dried to retain flavour and goodness. Made in kitchens surrounded by the Canadian landscapes the Orijen recipes take inspiration from Mother Nature creating recipes which full of freshness and variety which mirrors their natural diet reducing the need for synthetic ingredients. Using regional ingredients such as cage free chicken from Alberta Prairies and flounder from Vancouver Island, BC Orijen understand the importance and power of high quality ingredients and how they help keep your dog in optimum health. Analytical Constituents: Crude Protein 45%, Fat 35%, Fibre 1%, Moisture 2%.